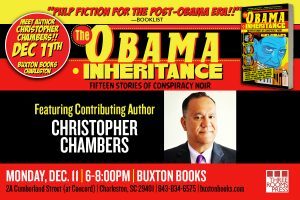 THE OBAMA INHERITANCE contributing author Christopher Chambers is going to Los Angeles‘s very own “The Last Bookstore” before going to Charleston‘s Buxton Books! 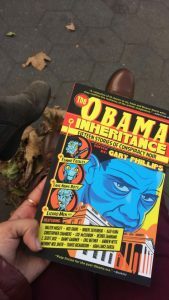 Please join the Los Angeles Review of Books and LA legend and editor Gary Phillips along with authors Danny Gardner, Travis Richardson, and Désirée Zamorano for a conversation with Tom Lutz and Steph Cha on “The Obama Inheritance: Fifteen Stories of Conspiracy Noir” (Three Rooms Press, 2017). This event is free and open to the public and will take place at The Last Bookstore. Join us for a reading and signing with contributing author of THE OBAMA INHERITANCE: 15 STORIES OF CONSPIRACY NOIR, featuring author Christopher Chambers. 11 December 2017. 6:00-8:00 PM.